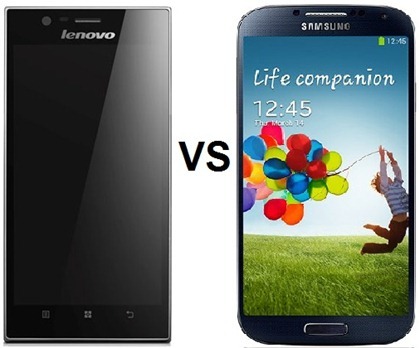 The Lenovo K900 was recently unveiled and has managed to create a lot of buzz, and people have already started comparison between the K900 and other flagships, say for example the Samsung Galaxy S4. In this post, we will be comparing these two flagships against one another, and we’ll know which phone is the better one among the two. Although the Samsung Galaxy S4 costs quite a bit more than the K900, the specifications of these phones are more than comparable. Both come with top-of-the line processors, great camera hardware, and good batteries. There cannot be one hands-down winner, but slight differences can make either one suitable for you. Let us take this forward. This is probably the only one segment where the phones are very distinct, with the K900 having a 5.5 inch display whereas the Galaxy S4 comes with a 5 inch display. Both the phones come with a full HD resolution of 1920×1080 pixels, which means the screen is going to be a treat on both. However, since the screen on the S4 measures 0.5 inches lesser diagonally and packs the same resolution, it means that the pixel density on the S4 is going to be higher than the K900 since the K900 has a bigger screen, i.e., pixels are not as tightly packed as on the S4. But let us tell you, there might be a difference, but honestly for a human eye it is very difficult to realize this difference in pixel densities. The processor on the S4 is 4+4 core Exynos 5 series, where 4 Cortex A7 cores are clocked at 1.2 GHz, while the other 4 Cortex A15 cores are clocked at 1.6 GHz. The system switches between the cores depending upon the requirement. The A7 cores are more efficient with the battery, so the A7 cores are used when the user does not demand too much processing power. The Lenovo on the other hand comes with the Intel Clover Trail+ chipset, which houses a dual core Intel Atom Z2580 processor in itself. The Atom is clocked at 2GHz and provides excellent processing power. Both the phones come with the same set of cameras when we speak of the pixel count. The rear camera on both the phones is 13MP and the front 2MP. By now most readers must be aware that it is not only the megapixel count which decides how good the camera is, but other factors such as lens aperture, software optimizations, etc count in a big way too. Relying on numbers, we expect both the phones to have equally good cameras, while the real-life quality from the K900 still remains to be seen. The S4 comes in 3 variants, the 16GB, 32GB and the 64GB, whereas the K900 only comes in the 16GB variant. However, both these devices come with a microSD card slot which means you can expand storage as and when needed. The K900 can take a maximum if 32GB microSD cards, while the S4 can take 64GB. When storage is concerned, the S4 does beat the K900. Both devices have huge batteries, the Lenovo K900’s measures at 2500mAh whereas the S4’s battery is rated at 2600mAh, 100mAh more than that of the K900. In order to make the phone more robust and compact, Lenovo have not included an option to remove the battery, i.e., it is not user replaceable. However, it is service replaceable, which means that when you feel the battery is dying, you can take it to a Lenovo service centre and let them replace it for you. The S4 does not boast of any sort of robustness, and comes with a standard removable battery. There are some other features in the S4 which the K900 does not have, for example eye gestures, smart stay, etc. Although these are innovations from inventive people, we do not know how many people actually use these features in their day to day life. Lenovo have done well to launch a phone that has the potential in it to challenge flagships from popular manufacturers as Samsung. The K900 is a more robust phone, and this also shows in the weight of the phone; the K900 weighs a hefty 162g whereas the S4 weighs 130g. What does this mean? This means that the K900 might not be the most ideal phone for women and people with small hands. Although the weight will feel good at first, but with time it might get cumbersome. But again, the K900 will retail for almost 5,000 INR lesser than the S4, so it is up to you to decide what you prefer more; save 5,000 or get the support of Samsung. its K900 and battery is not removable. I HAVE HEARED THAT K900 IS NOT HAVING SD CARD SLOT TO EXPAND MEMORY AS ONLY THE INBUILT MEMORY OF 16GB. yes the current version of k900 is does not have slot for microSd memory card slot and in built memory is 16gb.